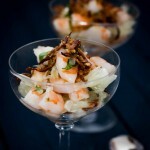 A modern take on the traditional prawn cocktail, this Prawn and Pomelo Salad with Caramelised Coconut bursts with summery flavours! When I saw a stack of pomelos at the local grocer’s the other day I got excited, because as much as I love grapefruit (a hybrid of pomelo and an orange), I absolutely adore the milder flavour and slightly more grainy texture of this fruit. Known as Chinese grapefruit, the fruit is used in a lot of South East Asian cuisines, especially in salads, because the seeds don’t burst as easily as the case may be in other citrus, which means the juices don’t go spilling everywhere making a soggy mess. Perfect for a crab salad or a cooked prawn cocktail Asian-style! And what better way to spruce up a tangy Asian seafood and citrus salad than with a touch of crunchy, caramelised coconut? Pomelos can be found at many Western and Asian grocers. The fruit has a thick skin and pith which can be cut off with a knife. Wedges are peeled more easily by hand. Lefotver pomelo wedges can be eaten on their own, but they also make a great addition to fruit salads or an Asian slaw. Chop prawns into 1cm pieces. Peel the pith off the pomelo wedges, break pieces into loose chunks. Combine fish sauce and lime juice in a bowl. Add prawns and pomelo seeds. Mix well. Set aside. preheat oven grill to hot. Mix coconut and brown sugar in a bowl. Spread sugared coconut on a baking tray lined with some non-stick baking paper. Place under the grill for 1-2 minutes or until the coconut starts to become golden brown. Remove from grill and allow to cool before handling. 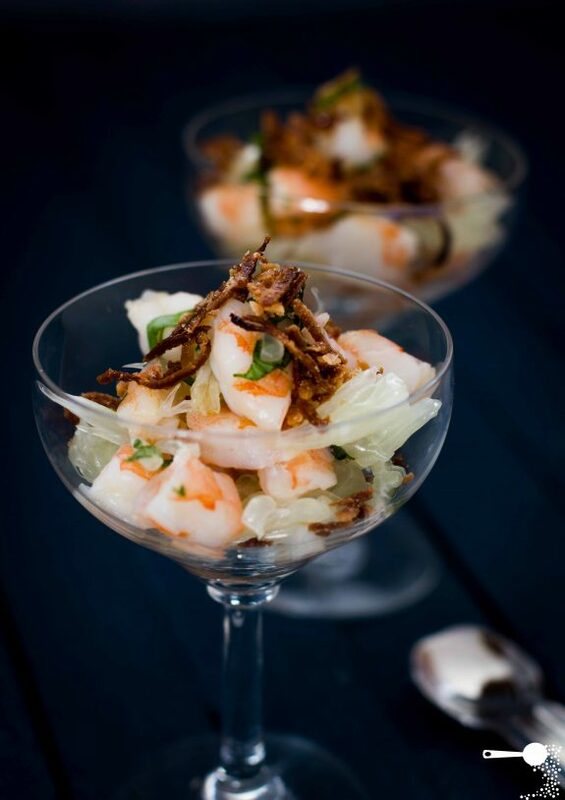 Divide prawn and pomelo mixture between your serving bowls. Top with some crunchy caramelised coconut. 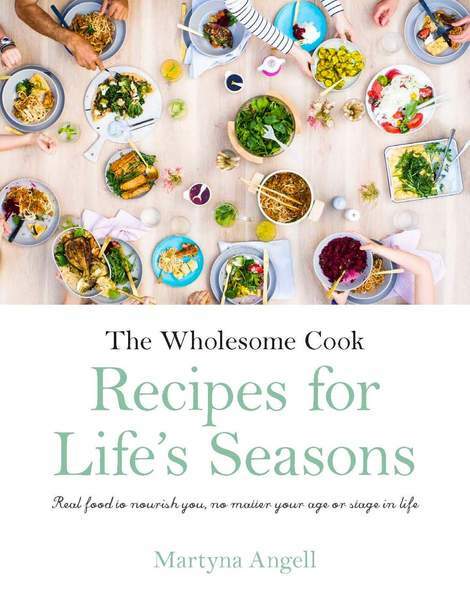 Sounds delicious and the photos are beautiful! I’ve never had a pomelo, but from your description – I think I would love them. I’ll be on the lookout at my grocery store. This dish looks delicious, and I absolutely love your photos. That looks really delicious, beautifully presented. Caramelised coconut sounds fantastic – never seen it done before. Pomelo’s are the best and I just can’t get enough of them, especially now that I’m visiting Vietnam where they are in abundance. Love your take on this classic! Never tried a pomelo before, but I think I’ll keep my eye out for one just so I can try it. I’m curious now. I love this!! I’ve wondered what to do with a pomelo.. thanks for sharing this today! Yum! Love the combination of flavors here – sounds fantastic. The caramelized coconut brings this dish over the top. I love pomelos too. The very first time I tried a pomelo was on the river boat in Thailand scourging through the orient to find some spices in the wet market. What a gorgeous dish. All my fave flavours, but the caramelised coconut just makes it shine. I actually have coconut sugar, wonder how that would go instead of brown?? I love this whole dish, but the caramelized coconut really seals the deal. Fantastic and simple salad! I have always preferred the tangy grapefruits, but I have never thought of salads… Pomelo makes more sense here. This would be the perfect salad for me!